Jeans are a signature basic in most wardrobes. 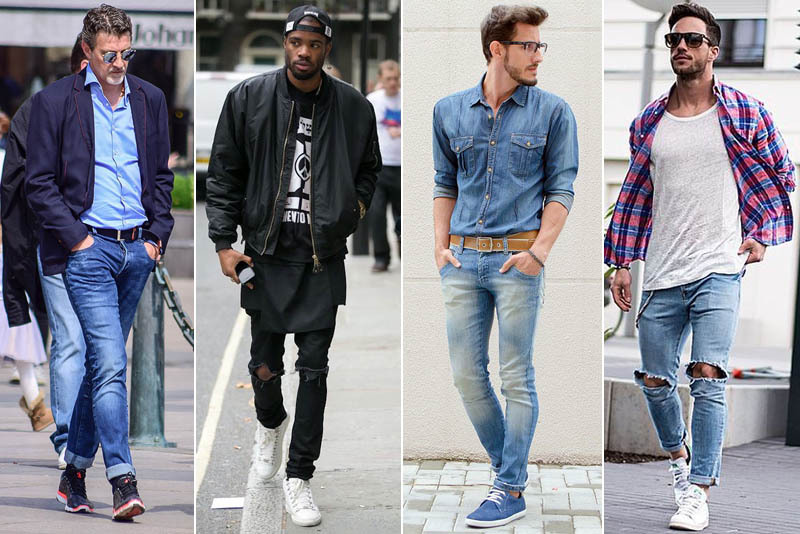 Men tend to reach for jeans as a go-to closet staple on casual days. Equally important is finding the appropriate casual men’s shoes to wear with jeans. When it comes to putting together the perfect casual outfits for men, the right footwear can make or break otherwise-stylish ensembles. Depending on the occasion, event and weather, there are an abundance of casual men’s shoes to wear with jeans. Also, you can even dress up a pair of jeans with the right shoes and shirt and have a business-casual office look in seconds. Here are some of the most popular styles of shoes for men on the market today. Whether you like the look of high-top athletic kicks or low-top canvas shoes, sneakers are the epitome of the perfect casual men’s shoes to wear with jeans. You can dress them up a bit by wearing a polo shirt or button-down plaid Oxford, or grab a novelty graphic t-shirt for a cool casual vibe. Low-top sneakers should be worn with no-show socks or without socks altogether. On the other hand, high-top athletic shoes should be paired with socks that match closely in color to the jeans. Classic sneakers look best with skinny and relaxed styles of jeans. Most office dress codes frown upon wearing jeans with sneakers, so this style combination should be reserved for running errands, attending concerts and venturing out for a casual dinner with friends. A step up from the athletic shoe is the slip-on shoe. There are several subcategories of slip-on shoes that range from casual to semi-formal. Boat shoes are a great casual men’s shoes to wear with jeans. They shoes are meant to be worn without socks, and they are a preppy style that many men gravitate towards in the warmer spring and summer months. 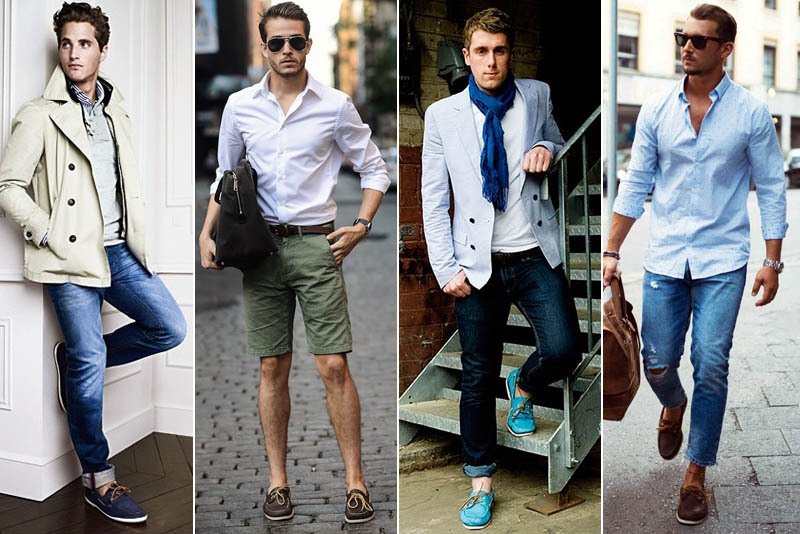 Boat shoes look great with polo shirts and dark-wash jeans or Bermuda shorts and graphic t-shirts. As a matter of fact, button-down shirts and argyle sweaters also pair great with boat shoes. 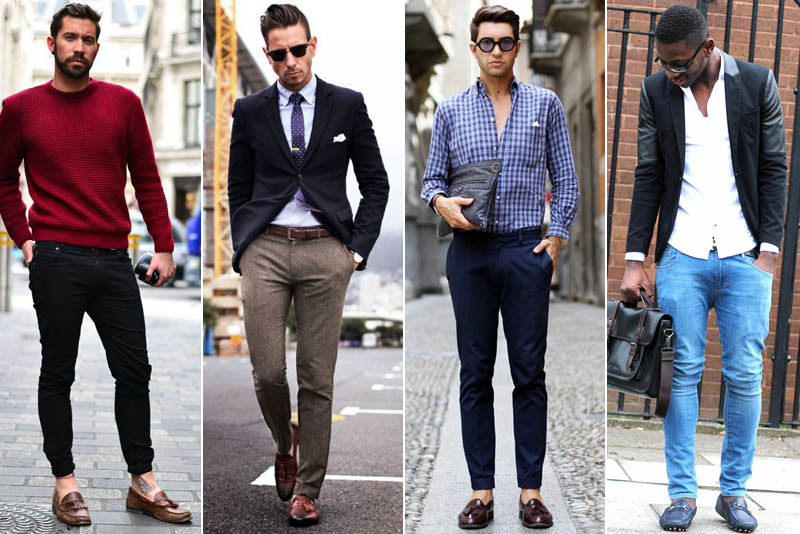 Loafers are a semi-dressy option to pair with jeans. 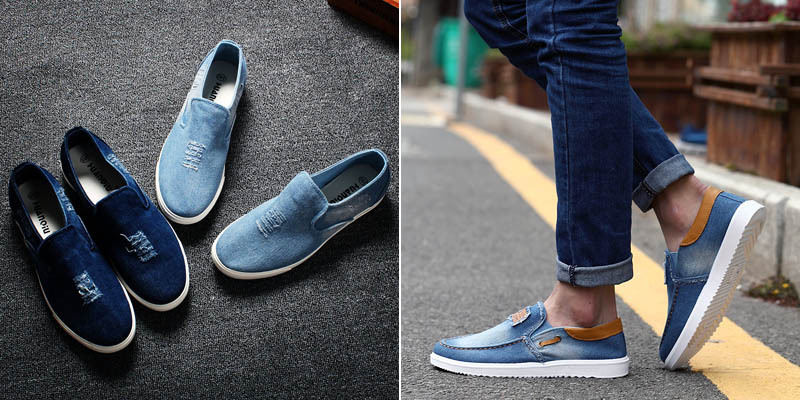 Most loafers are constructed from leather, but there are also many casual canvas loafers that work better with relaxed-fit jeans. Dressy leather loafers can be taken up a notch when they feature tassels or have the distinct penny-loafer styling. In dressier leather with classic touches, loafers can easily bridge the cap between casual and refined. Many business-casual office environments will let employees wear dark-wash jeans with classic loafers, button-down dress shirts and blazers. Arguably the most casual men’s shoes to wear with jeans are sandals. 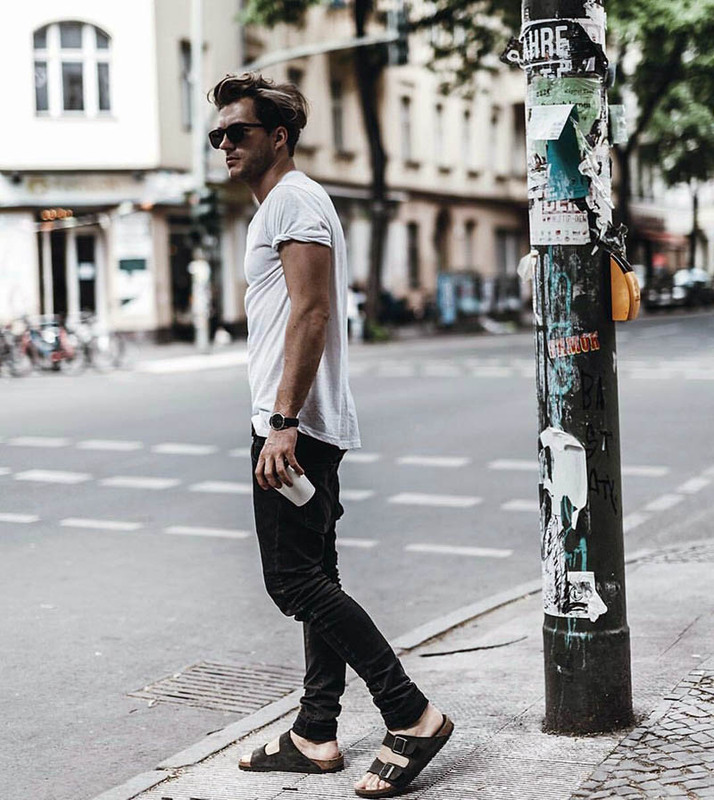 From uber-casual canvas hiking sandals with buckles to flip-flops and dressier leather styles, sandals are a casual must-have shoe for men in the spring and summer months. Indeed, jeans and t-shirts beg to be paired with hiking or leather sandals. Flip-flops are also perfect with jeans and cargo shorts, and they are the go-to beach or summer festival slip-on shoe. The main difference between a Chukka and Chelsea boot is the amount of hardware present on each style of shoe. Chelsea boots have a sleek silhouette and feature a stretchy, elastic gored panel that makes them the perfect slip-on boots for dressier occasions with dark-wash jeans. On the other hand, chukka boots often have hardware, grommets, rivets or buckles. Nevertheless, both boot styles feature a mid-top style with low-profile heel. These boots look great with bomber and moto jackets, graphic t-shirts and a wide variety of slim and skinny jeans. 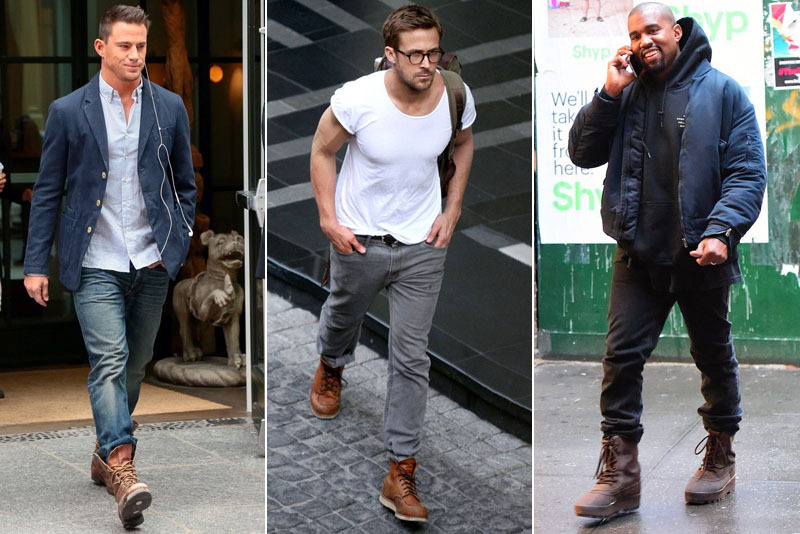 In spite of the chukka and chelsea boots, hiking and work boots often showcase a much higher profile and have a lace-up front style. 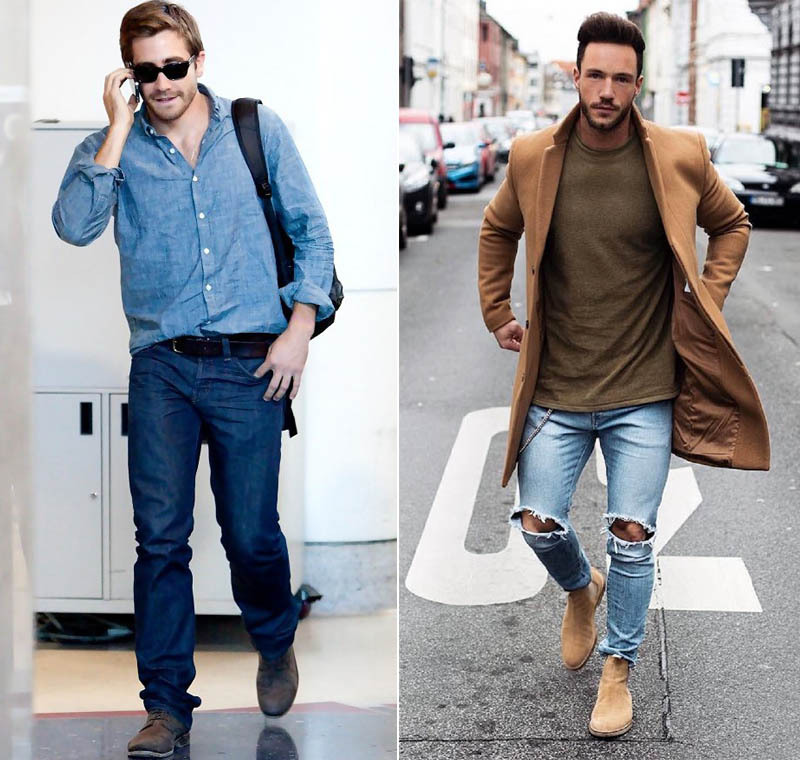 These very casual boot styles work best with light-wash denim jeans, carpenter shorts and pants, t-shirts, rain jackets as well as very casual windbreakers. Notable, you do not necessarily have to work in a trade that requires a heavy-duty work boot to enjoy wearing this rugged style of footwear. It is impossible, however, to incorporate these uber-casual boot styles into a corporate office environment. As such, casual, hiking and steel-toe work boots are the perfect casual men’s shoes to wear with jeans. Brogue shoes are among the dressiest types of footwear for men, but that is not to say they are reserved exclusively for corporate environments. Similarly, many urban and hipster subcultures have adopted brogues and paired them with modern classic clothing styles to give a unique and unexpected look. Additionally, brogues can easily pair with a buffalo-plaid flannel, aviator sunglasses and cuffed skinny jeans; this look is decidedly hipster and sleek. In the urban subculture, vibrant-colored vintage sweaters can be seen being worn with dark-wash jeans and chunky chain necklaces in an effortless and cohesive manner. Of course, brogue shoes are also the perfect office-friendly work shoes when paired with an Oxford shirt and pantsuit. Brogue shoes have wingtip detailing, and most feature a lace-up style. 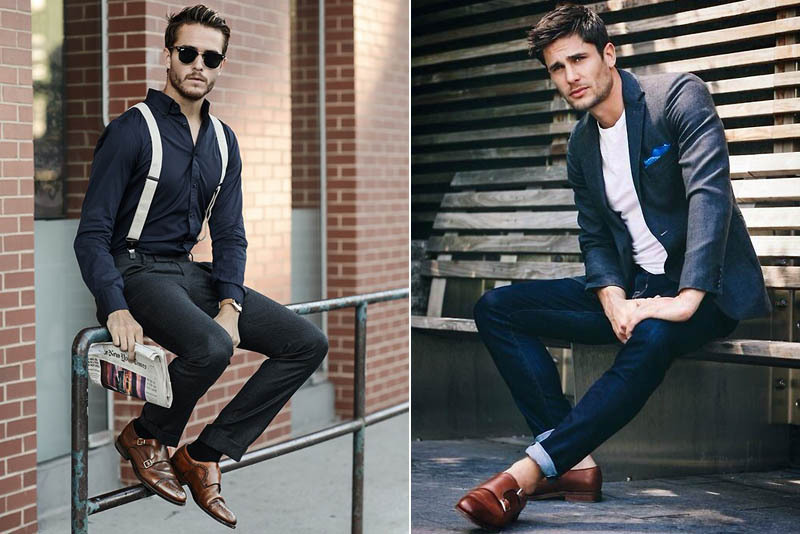 A dressy crossover between open-laced shoes and loafers are the classic monk strap shoes. Most often constructed of fine leather, monk strap shoes bridge the gap between casual and dressy. The single, crossover straps will often feature buckle, clasp or snap closures, and they can be dressed up with a suit or dressed down with dark jeans and a classic crew sweater. When it comes to pairing your jeans with your shoes, lighter washes are typically associated with more casual footwear styles. Canvas slip-ons, athletic shoes, sandals and hiking boots look great with distressed, whiskered, sandblasted and light-wash denim jeans. Cargo or field jackets, t-shirts and tank tops all complete the more basic looks that feature light denim and casual footwear. Dark-wash or black jeans tend to be aligned with more dressier footwear styles. 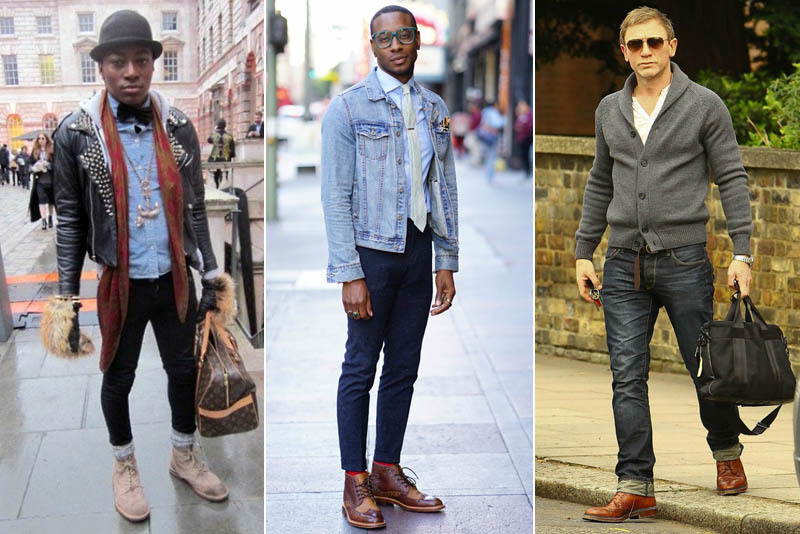 Monk strap, brogue, Chelsea and Chukka boots, and leather loafers all pair perfectly with dark-denim, fitted jeans. Blazers, bomber jackets, moto jackets, cashmere sweaters and button-down Oxford shirts all look refined with these dressier shoe styles. Jeans are universal and versatile bottoms that every man should have in his wardrobe. They can be dressed up or down depending on how they are styled, and they are always in fashion.